It is sometimes hard to predict what inspires us. After a week of depressing news about how our world is slipping from the path of inclusion and acceptance I find myself asking: what can I do to make this world a better place for my children? People are looking at the world right now in a very narcissistic way. My future, my job, my house I don’t have, what I want now. The culture now reminds me of one of the things the purportedly differentiated the Japanese auto makers from the US automakers in the 80’s and 90’s. Looking at quarterly profits vs a ten-year plan. Setting the foundation for a long-term investment vs what can I do now to maximize what benefits me. I can’t pretend to know if that was, in fact, true, but it represent an ideological paradigm of delayed gratification for a long-term future vs a narcissistic approach to instant gratification. This is important because countries and people across the world are seemingly thinking more in a nationalistic way as opposed to global wellbeing. Case in point is the roll back of EPA regulations. Why invest in something now that will take years to make a difference when we need jobs now? You can just as easily ask the question, why leave my money in the bank when I want a new car now? Protecting the environment is an investment in our kids future, not our own, it’s not tangible and is only meaningful if we are not so narcissistic to think that it matters. I use these as examples so that we can examine human rights in the same vein. Repression, and discrimination robs us of our future and those of our descendants. We ignore the possibility of a better future by scaling back on the progress we have made towards a more diverse, accepting society. The United States was one of the original nations to push this agenda of Human Rights on the United Nations. 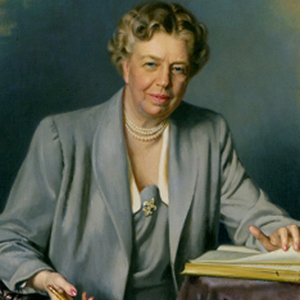 In a time when the world was more divided than ever, after World War II, Eleanor Roosevelt was a voice the world listened to. I don’t want to pretend that the US was all wonderful. Everyone who has watched “the Help” or knows that the average life expectancy of someone with Down Syndrome in the 1970’s was in the 30’s knows that our very recent history was terrible by many accounts on the subject of Human Rights. This is where leadership comes in. Great leaders don’t just complain about what is wrong with the world, they don’t just push buttons and blame others. Great leader raise us up, they make people believe that we are capable of more. In a perfect world this means everyone. I don’t mean this as an ideological statement on political beliefs; this is a statement of inspiration. Parents model good behavior. Your children will do as you do, if you tell them to be good but continue to set an example contrary to your words, they will emulate what you do. Leadership is a form of parenting, and great leaders understand that. One person may not be able to change everything, but one person can set the example. At times like these we need leaders to help us begin the journey, not to use hate and diversion to force us on a path of fear. A leader can be anyone with the heart and courage to make a difference. Titles and political appointments don’t make you a leader. I wrote this today being inspired by Eleanor Roosevelt’s words. We have cell phones, computers, and apple watches, but we don’t have inclusion and acceptance, at least not everywhere. No clichés today, just hope. No matter what’s going on we have to have hope. Hope is our time traveling superpower. With hope we can accomplish anything, without it, nothing.